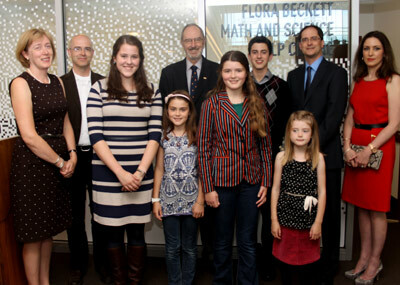 On Friday a ceremony was held paying tribute to one of the most enthusiastic advocates for UNB Saint John, Ms. Flora Beckett with the naming of the Math and Science Help Centre after her. A huge turnout of family, friends and former colleagues gathered at the Hans W. Klohn Commons to recognize Flora. Her husband Barry, their children Lesley, Alex and Stephen and their grandchildren were all in attendance for the ceremony. Flora, along with Barry - a long-time chemistry professor, registrar emeritus and former president of the Associated Alumni - was with UNBSJ from its beginning, shortly after they arrived in Saint John in 1966. A native of Sackville, New Brunswick, Flora taught mathematics at UNB from 1975 to 1998. After she retired she taught the first UNB course at Beijing Concord College in China. She was also the first coordinator of the Math Help Centre on the Saint John campus. She was also extremely active in the community, supporting numerous events and volunteering her time and expertise to many organizations and charities. Flora was a great supporter of UNB alumni and along with Barry, travelled extensively and met our UNB grads with great enthusiasm. Just two years ago, she was awarded an honorary membership to the UNB Associated Alumni for her outstanding service to the university community. Both her daughter Lesley, the associate director of Libraries for Learning and Research Services at UNB, and her husband Barry touched everyone in attendance with their heartfelt remarks regarding their mother and wife. The Math and Science Help Centre provides free assistance from tutors to students taking first-year mathematics, statistics, computer science, physics, and chemistry courses. It is a fitting tribute to name the Math and Science Help Centre after such an extraordinary woman. Her legacy will continue to change lives for generations to come.